House and Senate Reach a Budget Deal: The agreement would raise military and domestic spending over the next two years but prevent another government shutdown. WASHINGTON — House and Senate budget negotiators reached agreement Tuesday on a budget deal that would raise military and domestic spending over the next two years, shifting the pain of across-the-board cuts to other programs over the coming decade and raising fees on airline tickets to pay for airport security. The deal, while modest in scope, amounts to a cease-fire in the budget wars that have debilitated Washington since 2011 and gives lawmakers breathing room to try to address the real drivers of federal spending — health care and entitlement programs like Medicare and Social Security — and to reshape the tax code. Both negotiators promised an end to uncertainty and the lurching from crisis to crisis, at least for a year. But both parties sought to preserve their ability to force another showdown over fiscal matters; the government’s statutory borrowing authority will lapse as early as March, another potential crisis. The budget deal also allows Republicans to remain focused on attacks on the health care law. And party members who are thought to have White House ambitions — like Mr. Ryan and Senator Marco Rubio of Florida — are likely to use this agreement, and future fights over money, to further their prospects in 2016. Still, the announcement drew praise from House Republican leaders, who are likely to put it to a vote by Thursday. “While modest in scale, this agreement represents a positive step forward by replacing one-time spending cuts with permanent reforms to mandatory spending programs that will produce real, lasting savings,” Speaker John A. Boehner of Ohio said in a statement. The proposal quickly drew fire from conservatives who saw it as a retreat from earlier spending cuts and a betrayal by senior Republicans. Some excoriated Mr. Ryan, the party’s vice-presidential nominee in 2012, for rolling back immediate spending cuts in exchange for promised savings that may never materialize. The agreement, which would finance the government through Sept. 30, 2015, would eliminate about $63 billion in across-the-board domestic and military cuts. But it would provide $23 billion in deficit reduction by extending a 2 percent cut to Medicare providers through 2023, two years beyond the cuts set by the Budget Control Act of 2011. 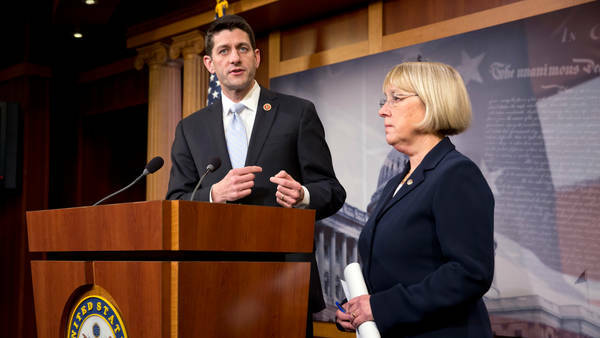 For Democrats and their negotiator, Ms. Murray, the deal is a turning point in the spending wars that have dominated the Capitol since Republicans swept to control of the House in 2011. For Republicans and their negotiator, Mr. Ryan, the deal should mean the political focus can remain on Mr. Obama’s health care law and not on another round of budget brinkmanship next month with the government moving to another possible shutdown. While the agreement had the backing of senior House Republicans, Heritage Action, the political arm of the Heritage Foundation and a group influential with rank-and-file House Republicans, came out against the deal even before it was announced, as did Americans for Prosperity, the advocacy group backed by the billionaire brothers Charles and David Koch, and Koch Industries, the conservative brothers’ energy and paper conglomerate. “We will hold members accountable, Republican and Democrat, if they go forward and vote to raise spending above sequester levels,” said Tim Phillips, president of Americans for Prosperity. He was referring to automatic, across-the-board spending cuts mandated by the 2011 Budget Control Act. Senator Mitch McConnell of Kentucky, the Republican leader, who is up for re-election next year, also expressed reluctance to reverse those cuts if a broader, multitrillion-dollar deficit reduction deal could not be reached. Under the agreement, military and domestic spending for the current fiscal year that is under the annual discretion of Congress would rise to $1.012 trillion, from the $967 billion level it would hit if sequestration spending cuts were imposed next month. Spending would inch up to $1.014 trillion in the 2015 fiscal year. The figure for this year is about halfway between the $1.058 trillion passed by the Senate this spring and the $967 billion approved by the House. Military spending would be set at $520.5 billion this fiscal year, while domestic programs would get $491.8 billion. The $63 billion increase over the next two years would be spread evenly between Pentagon and domestic spending, nearly erasing the impact of sequestration on the military. Domestic programs would fare particularly well because the 2 percent cut to Medicare health providers would be kept in place, alleviating cuts to programs like health research, education and Head Start. The increase would be paid for in part with higher airline fees that underwrite airport security. Higher contributions from federal workers to their pensions would save about $6 billion. Military pensions would see slower cost-of-living increases, a $6 billion savings over 10 years. Private companies would pay more into the federal Pension Benefit Guaranty Corporation. States receiving mineral revenue payments would have to help defray the costs of managing the mineral leases, saving $415 million over 10 years. Deepwater, natural gas and other petroleum research programs would end. Democrats gave up their demand that the deal extend unemployment benefits that expire at the end of the month, but they hope to press for an extension in a separate measure. For Republican leaders, the deal would erase the threat of another government shutdown on Jan. 15, when the stopgap spending measure that reopened the government in October runs out. It will now be up to Mr. Ryan to sell the accord to wary congressional Republicans.